Battleground is not the type of movie I view if I can help it. Sure, it's set during World War II, but where's the romance? Think Rita Wilson's versus Tom Hanks' camp in Sleepless in Seattle (1993). I go for An Affair to Remember over The Dirty Dozen every time. 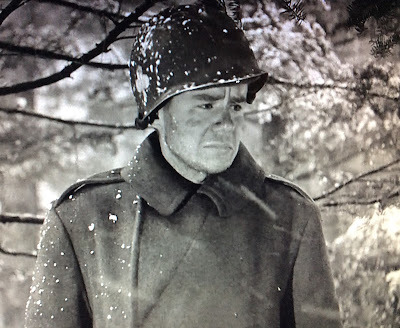 I viewed Battleground as part of George Murphy's filmography during the Marathon Stars Blogathon. Of the five films I set out to watch, this was the one I most dreaded, but it has become one of my favorite film finds of the year. Battleground depicts the Battle of Bastogne with remarkable realism. As I watched Battleground, I felt I was experiencing World War II firsthand. There is reason for this. The script was written by Robert Pirosh, a soldier who actually lived through the Battle of the Bulge. Four years after World War II, Pirosh reveals what it was like to be a soldier, and he doesn't hold back. The film is peppered with details that show the ugly reality of war--details earlier films swept under the rug in order to ensure civilian morale. In Battleground, frostbitten feet must turn color and fevers must be 102-degrees Fahrenheit or higher before the aid station takes soldiers. As the battle worsens, a soldier must be bleeding to get help. Soldiers walk around or take cover next to dead bodies without flinching. A soldier digs through boots of the deceased to find new shoes, and an elderly lady rummages through trash for food. "All we do is lie around 'til the fog lifts, so the air corps can come up and win the war for us," Wolowicz gripes to fellow soldiers Jarvess (John Hodiak) and Holley (Van Johnson), pictured here with Denise, a local French woman (Denise Darcel). Later in the film, the GIs will feel differently about the military aviators. Through Holley, Battleground scoffs at home front propaganda, which paints a fairy tale picture of the army. Holley sarcastically repeats, "I found a home in the army." When one of his peers dreams of beer and hardshell crabs, Holley playfully scolds him, reminding him that they are fighting for mom's blueberry pie. He adds, "Am I gonna kick if I don't get my job back? No siree!" His cynicism would have hit a chord for many veterans in the audience who experienced the same. The film also comments on the inefficiency of military procedures. Though technically Pop (George Murphy) has been given the okay for a "dependency discharge," he cannot leave without the official letter. 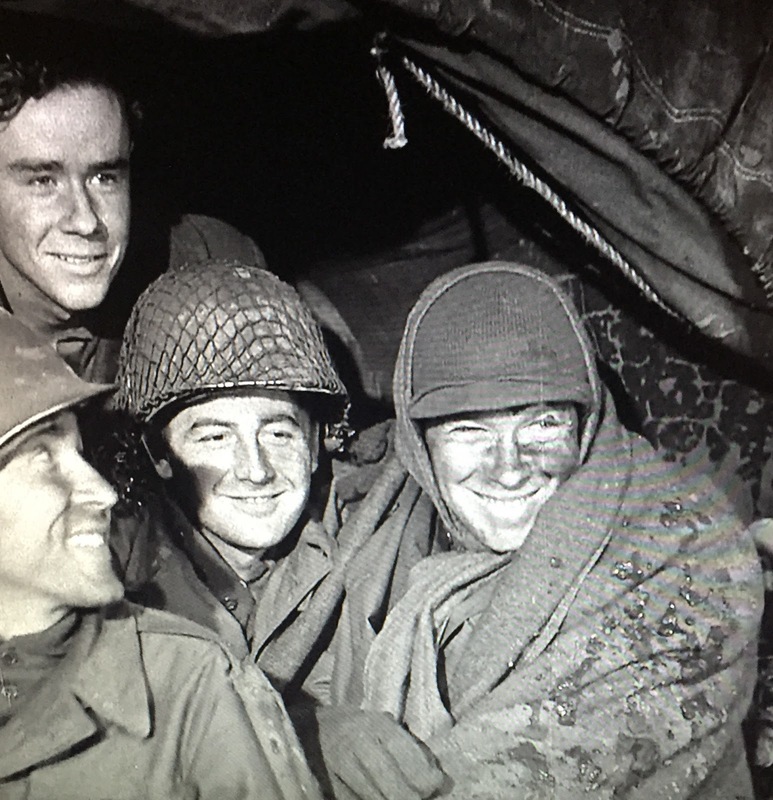 Although the soldiers are warned to take care of their gas masks, the men, overburdened with equipment, shed what they view as ineffective protection. One by one, the soldiers throw out their masks as they march into battle. Pop leads the way, pictured here with his foxhole partner Rodrigues (Ricardo Montalban). In addition to traditional gunfire and bombing, with which the audience would be familiar, the film depicts the psychological techniques Nazis inflicted on exhausted soldiers. Enemy airplanes drop leaflets onto the battlefield during Christmas. The leaflets try to induce guilt, reminding the men that their families are at home praying for their safety, which they could have--along with a hot meal--if they surrender. The Nazis tell the soldiers they are outnumbered ten to one. Later a German broadcast indicates that many members of their division have already surrendered. Sometimes the details are not about the horrors of war. They simply add to the authenticity of the film. 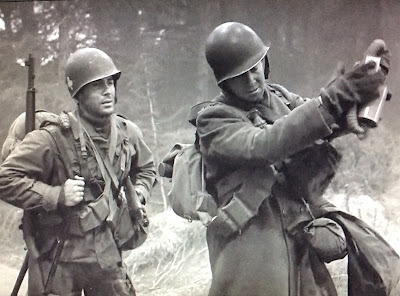 The soldiers use slang unique to the army; e.g., "steel pots" for helmets and "incoming mail" for bombs. They rip off patches before going into battle so the enemy cannot identify their rank. They spend their energy digging foxholes only to be told the orders have changed and they have to move. In lighter moments, they play imaginary baseball. Pirosh creates characters who feel like real people. Considering he was present during the battle, there is a good chance that their idiosyncrasies are pulled from aspects of soldiers he knew. There is the soldier (Guy Anderson) who keeps his watch on Illinois time, so he feels closer to his family; the toothless soldier (Douglas Fowley) whose clicking dentures become an extension of his vocabulary; the West Coaster (Ricardo Montalban) who is thrilled to see snow for the first time; the former newspaper reporter (John Hodiak) who is frustrated that his wife, also a reporter, knows more about what is occurring in the war than he does; his uneducated partner (Jerome Courtland) whose songs reflect a country upbringing and repeatedly grates on Hodiak's nerves with his, "That's fer sure. That's fer dang sure." At the beginning of the film, he is new to the outfit, optimistic, clumsy, scared. On the battlefield, he hears of a friend's death and learns that the company didn't remember his friend's name. His reaction to the news shows he is alarmed but has not been hardened by war yet. However, through the course of the film, he transforms from naive boy to experienced soldier, eventually becoming more jaded than the surrounding veterans, who have learned hope is an essential element of survival. Pirosh further paints his characters with a human stroke by not masking each soldier's natural desire to escape fighting and go home. At the same time, they bravely face the battle and move forward, but there is no illusion that this is always an easy decision. Often, soldiers do the right thing without consciously deciding to do so. The film also shows how each copes with being under fire: some sing, some small talk with their neighbor, others smoke. And when it appears that one of them might die, it hurts because we have gotten to know the characters' human qualities. It would be remiss for Classic Reel Girl to overlook an exchange which makes reference to taxi dancers. The term comes into play when Holley and Denise try to find a little amusement by dancing. In the scene, Pirosh adds another dimension to the characters: life before this battle, before the film. Side note - Wonderful staging here. Jarvess, who is listening to the exchange, asks Denise to get coffee. She cheerfully agrees, to which Kip mumbles, "Anything you want. Sure, as long as you pay for it. They're all alike up here." Without spelling it out, Pirosh has shown that Kip must have had a bad experience with a woman in the past. Did he give his heart away to a gold-digger? Or is he simply jealous of the attention Denise is giving Holley? Jarvess defends Denise, "Yes, they're all alike, Kip! Scared. Hungry. Lonely." He understands humanity at war. Did his newspaper column take him to war-ravaged countries like Spain in the late 30s? Again the audience is not directly told, but there is enough meat in the dialogue to read between the lines and to give a hint at life prior to this war. 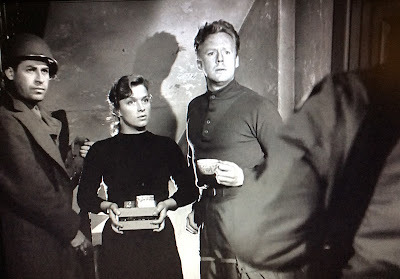 Credit is to be given to director William Wellman and cinematographer Paul Vogel who create suspense through film shots that put the audience in the soldiers' shoes. 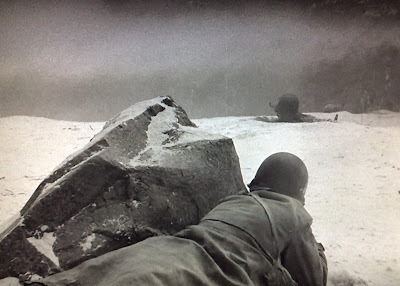 Camera angles, which show only American and German boots as the soldiers battle mano y mano, leave viewers on the edges of their seats, waiting to see the final outcome. The audience looks into the forest from the American soldiers' vantage point: fired upon, but unable to see the enemy through the thick fog. The final scene takes the viewers full circle. 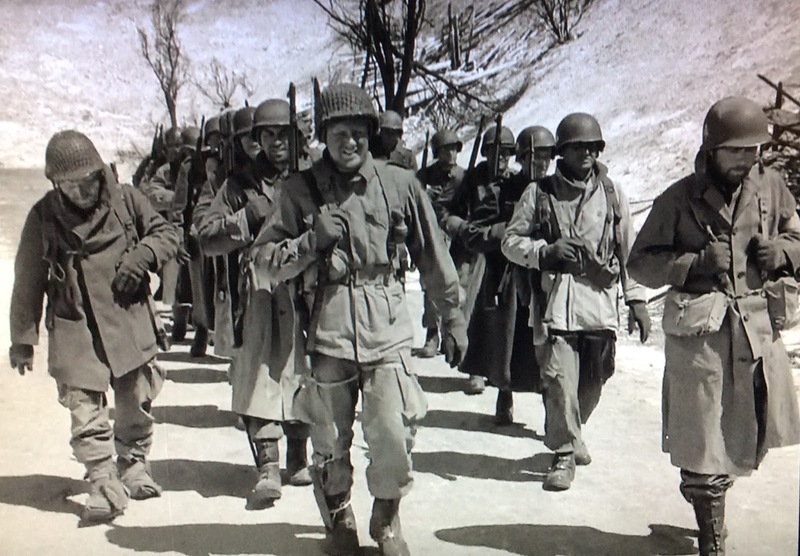 Kinnie (James Whitmore) leads his company in a march and chant. He walks with limp, the group is noticeably smaller, their march less energetic, yet there is pride in each step. They may be battered, but they are undefeated.